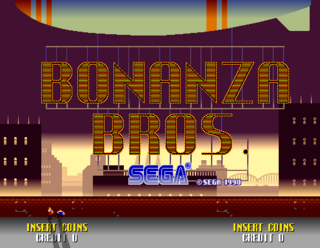 Bonanza Bros. (ボナンザブラザーズ) is a 1990 arcade game developed by Sega for the Sega System 24 arcade platform. In the game the player either controls Robo (red) or Mobo (blue), two thieves (or, in the case of the Western console versions, security testers) who must retrieve several objects scattered around levels while avoiding guards in a stealth-like fashion. Each player is armed with a firearm which can stun the guards for a short period of time, but it is also possible to hinder the guards' progress by using various parts of the scenery. It is a two-player game, and the screen is always split horizontally. Bonanza Bros. was ported to the Amiga, Atari ST, Commodore 64, Sega Master System and Sega Mega Drive in the coming years. PC Engine Super CD-ROM² and Sharp X68000 ports also existed exclusively in Japan, and Amstrad CPC and ZX Spectrum ports were released in Europe. Some westernised versions of the game call Robo and Mobo "Mike" and "Spike" respectively. Likewise North American and Brazilian copies of the game refer to the game as Bonanza Brothers rather than Bonanza Bros..
More recently, Bonanza Bros. was made available through the Wii's Virtual Console service, as well as being made part of the Sega Classics Collection and Sega Mega Drive Ultimate Collection compilations. As well as this, the game was unlockable within the Japanese version of Sonic Gems Collection, but was strangely removed from western releases of the game. It has also been ported to various mobile phones by SoftBank Mobile. The arcade version of Bonanza Bros. was also included in volume 6 of the Sega Ages 2500 PlayStation 2 series. It is bundled with Puzzle & Action: Tant-R and its sequel, Puzzle & Action: Ichidant-R, both of which use a similar graphical style (as does Puzzle & Action: Treasure Hunt, which was not included). A slot machine based on the game was released in 2010. The Bonanza Bros. (Robo and Mobo) are playable characters in Sonic & Sega All-Stars Racing. On the Master System, Bonanza Bros. lacks the two player co-operative mode, and so the game is always presented in full screen. Some minor elements are missing and the stage layout is slightly different in places. The difficulty is also dialed back - for example, there are no enemies with shields on the first stage. In North American versions the plot was changed. Robo and Mobo became Mike and Spike. They are now famous investigators and were hired to test the security forces of the mysterious businessman's properties that have been targets for robbery recently. Both manual, box description and in-game intro text (scene which shows Bonanza Bros wanted poster was removed) were changed to reflect this. Main article: Bonanza Bros./Magazine articles. Main article: Bonanza Bros./Promotional material. NEC Retro has more information related to Bonanza Bros..